Earlier today, Converse Tumblr premiered "Hero," a song produced by Diplo and two former members of The Clash with vocals from Frank Ocean as part of Converse&apos;s "Three Artists, One Song" series. 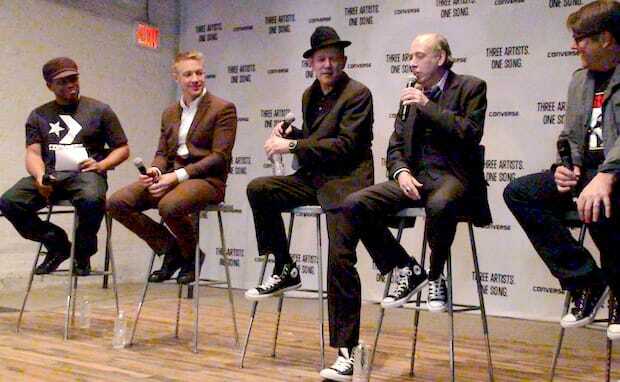 Late last week Paul Simonon and Mick Jones from The Clash joined Diplo at Converse&apos;s Rubber Tracks studio in Brooklyn to talk about the making of the song, and how they first connected via "Paper Planes." The first part of the conversation, moderated by Sway Calloway, touched on the common threads between hip-hop, punk rock, and reggae. Afterwards, during an exclusive interview with Diplo, Paul, and Mick, Reshma B of Boomshots spoke about the making of "Straight To Hell" and the inside story of the sample that changedDiplo and M.I.A.&apos;s career. Likening his own background and approach to music to that of The Clash, Diplosaid "We both have that reckless abandon. We don’t really look at any rules and we have successes and failures. These guys [The Clash] were always pioneers in sonics, of the way music sounded. In one way the message was punk rock but also the attitude of makingmusic was even more in that same punk ethos. That’s why we have a similar attitude." We both have that reckless abandon. We don’t really look at any rules and we have successes and failures. Former Clash vocalist and guitarist Mick Jones echoed the sentiment: "I actually think that hip-hop was the same as punk rock. When we had punk rock hat was our music in the streets when it started. And so was hip-hop when it started. And I could see a direct comparison there. But it’s also interesting what you said at the start, when you said &apos;I don’t get it.&apos; Because it was the same with reggae. When punk just came out and they said to Bob Marley, what do you think of punk rock? He said &apos;I don’t get it.&apos; And then Lee Perry was producing him, and he was producing us, for &apos;Complete Control&apos; very early on. And he said &apos;You know these guys are the same as you.&apos; And then later on, very soon after that, Bob Marley wrote &apos;Punky Reggae Party&apos; because Bob reconsidered. Because once again there were similarities." "We actually did a bunch of music together," said Diplo. "We probably made five tracks. We were just vibing. We have a lot of similar backgrounds. Like I said, we didn’t have any genres that we adhered to, but these guys had a background in reggae music too. I do a lot of stuff in reggae as well. And we just had a lot of time communicating and talking. I think we had four or five ideas. Over those three-four days we just kind of built those and created something that we loved. We sent em over to Frank and he chose one. We went back and forth a lot once we figured out the record and the direction we wanted to go with. In the studio we just had a good time. We listened to a lot of music that we were inspired by. Paul brought a lot of Western and East Indian music. I actually broke hisiPod." "I had a backup so it&apos;s OK," said former Clash bassist Paul Simonon, who still plays with Mick Jones as part of The Gorillaz live act and in The Justice Tonight Band. "We listened to a lot of music from the 50s, 60s from Pakistan or India. A quite interesting mix of Latin music combined with Ennio Morricone along with obviously the indigenous music." "I think you can definitely hear like Ennio Morricone kind of influence in the record that we made. It’s similar to like doo-wop and punk and garage—and Frank brings soul to it. So I love that it doesn’t have a foothold in there. And I think that’s what’s great about the three of us as collaborators." Musing on the possibility of future collaborations, Diplo said: “That would be amazing, to have a Clash andBeyonce song. We still have like five different songs. We’re still cooking on them. The vibe that we created in the studio is so easygoing and nice and cool and they’re so modest… I’m not used to that when I work with big stars. Usually there’s a lot ego in the studio, but I think they had a great attitude. I just love to collaborate with people who take my ideas real serious, and they don’t put up walls around them. These guys are just completely open. For guys who’ve been doing it for so long, to still have this open-ness to ideas, You don’t get that with young people anymore.These guys are some of the first to combine genres—and get huge hits out of that style. And I learned a lot from them. "Us too," Mick affirmed. "Our approach is presenting music as what it’s like now. It’s cool to try to be part of things." The interview began with The Clash sharing the finer points of living in West London during Notting Hill Carnival season. So you live in West London? MJ: I live in Ladbroke Grove. Oh Wow—Ladbroke Grove is a good spot for the carnival. PS: It is. It’s a really good spot. And if you live round there it’s good because…. You don’t have to look for a toilet. But the bad part is they use your front door for a toilet. MJ: The price of going to the toilet has gone up. They charge you, and it’s gone up. I know; it’s like two pounds. MJ: At least. It’s the cost of living. Hiya. It’s like five pounds every time you go to the toilet at Notting Hill Carnival. I had somebody who was one of the participants in the carnival. And there was like this enormous butterfly with enormous wings. And they knocked on the door and they said “I’m so desperate. I’m really sorry. I’m desperate for the loo. Can I use the loo” And I said yeah of course you can. Suddenly this giant moth came into the room. And I had to help the wings to get into the toilet cause it’s really small. It took a while to get him out too, because of the wingspan. PS: Crushed him in and then closed the door and let him have some privacy. And then helped unravel him out as he fluttered away to the rest of the procession. Did you charge him two quid? How much did you charge him? PS: It was for free. Oh wow I’ve never had such good luck in Notting Hill Carnival. Anyway guys, that was a dope new song. Let’s take it all the way back to “Straight To Hell.” Where did that song come from? PS: Well it’s all came together, in a way, didn’t it? It was sort of a riff, really. Actually there was a Gregory Isaacs song that I was listening to at the time, and that sort of gave me inspiration when I heard the basic pattern. There’s a song called—I think it’s called “Slave Ruler” [“Slave Driver” —Ed] and it’s got a certain pattern in it, and usually it’s played on the snare. But what Topper did, he took the snare off, so you just heard the sort of sound that you hear. But that’s all made up in the studio really. And Diplo, you sampled that track. Where did that idea come from? Diplo: I just love the sound. I actually love that… I knew that was guitar, like a harmonics kinda sound. I really liked the way that that loop sounds. I just had the intro of that song on loop for a while and it never got old for me. That’s when you know it’s a good sample. So I just built a song around that. And when you guys heard that, what did you think of it? PS: I though it was fantastic. The attitude, the vocal, everything. I though it was really good. And she’s from South London as well, Southhall—no, West London. You’re talking about M.I.A? She’s from Acton, right? Diplo: She knows Damon, you know? From a long time. She ended up living in West London with Damon’s girlfriend at the time for a while. She’s from everywhere in London. She went to school East—at St. Martin’s. So she’s just a product of London. So was it the British connect that made you choose that sample? And you know that song was a huge success, and at one point, you had all the biggest names in hip-hop rhyming over your beat. What did that feel like? Diplo: Felt good. [Laughter.] There was a lot of funny versions. Rick Ross did one. There was a lot of reggae. It was just cool. It was a really viral song that year, and I think t was fun to be a part of it. As far as M.I.A. would you ever work with her again in the future? Diplo: Yeah, I don’t know if she’s making music at the moment, but I think it would be really cool to do some stuff. Make some more good tracks. Diplo: I guess. I don’t know what we would make. I don’t think there’s… I don’t know what kind of music it would be now. At the time we were like the sound of that time. And we were making music that just came out of nowhere. And I think that really mattered back then. I think now, there’s a lot of people that are doing that—that are kind of with that punky vibe and stuff like that. But I’m not sure where we would go next. But you’re kinda open to that. Diplo: I’m open to anything, yeah. Always. And you guys, when you heard it, you said you liked the sample, but did you approve it? You guys all laughed about having your lawyers involved. Diplo: Cause we didn’t… Someone must have spoke about it. I don’t know… I don’t deal with any of that stuff. I actually thought they might not ever have heard it. They might just have somebody who does their publishing would have done the deal. But they must have checked it out, which is cool. Buy you didn’t try to do it sneakily, like, under the radar? Diplo: I actually had to replay all the samples cause I didn’t want to have to negotiate the master rights as well. There’s like all these things we were doing. But as the songwriters they had to, of course, know what was going on. And plus that’s like a pretty big song, their record. Also we were selling the song. We made a mixtape, me and MIA. We didn’t release that in any real form. We just sold it out of the back of our trunk—lots of uncleared samples on that. Diplo: If you want to make a big record out of it, you gotta probably make it all right, with all the parties involved. And guys, did you make a lot of money from it? They made a lot of money from it… Since you all have so much reggae influence, Diplo you’ve done a lot with dancehall and reggae in Major Lazer, and The Clash of course. PS: Big Youth. He’s pretty big. I Roy, U Roy, those guys. I reckon probably the most influential for me was probably Leroy Sibbles. He was the singer and the bass player for The Heptones. MJ: I would say Bob Marley. [smiling] You know? You guys linked up through Lee “Scratch” Perry right? MJ: In a way. Lee “Scratch” Perry produced “Complete Control.” It was our second single. He did that. And before that we forged this reggae / punk alliance sort of thing. Because there wasn’t that many punk records at the time. So we kind of supplemented it with reggae records as well. All that rebel music going on. MJ: And the deep bass. So what about you, Diplo? Diplo: I think you can’t really beat Bob Marley, especially the stuff he was doing with Lee Perry. Just that kind of cubby and dark and crazy stuff, even with the Wailers… Some of the songwriting was phenomenal. And I gotta just say Vybz Kartel. Somebody who came out of nowhere in the dancehall world and just took over an entire genre and questioned so many things. I loved his attitude too. Talking about Kartel, obviously his verdict is out any day now, do you have any opinion about what you think is going to happen? I know Busta is down there now supporting the trial.